GENEVA—Poverty in the United States is extensive and deepening under the Trump administration whose policies seem aimed at removing the safety net from millions of poor people, while rewarding the rich, a U.N. human rights investigator has found. Philip Alston, U.N. special rapporteur on extreme poverty, called on U.S. authorities to provide solid social protection and address underlying problems, rather than punishing and imprisoning the poor. While welfare benefits and access to health insurance are being slashed, President Donald Trump`s tax reform has awarded financial windfalls to the mega-rich and large companies, further increasing inequality, he said in a report. U.S. policies since President Lyndon Johnson`s war on poverty in the 1960s have been neglectful at best, he said. But the policies pursued over the past year seem deliberately designed to remove basic protections from the poorest, punish those who are not in employment and make even basic health care into a privilege to be earned rather than a right of citizenship, Alston said. Almost 41 million people or 12.7 percent live in poverty, 18.5 million in extreme poverty, and children account for one in three poor, he said. The United States has the highest youth poverty rate among industrialized countries, he added. Its citizens live shorter and sicker lives compared to those living in all other rich democracies, eradicable tropical diseases are increasingly prevalent and it has the world`s highest incarceration rate ... and the highest obesity levels in the developed world, Alston said. However, the data from the U.S. Census Bureau he cited covers only the period through 2016, and he gave no comparative figures on the extent of poverty before and after Trump came into office in January 2017. The Australian, a veteran U.N. rights expert and New York University law professor, will present his report to the United Nations Human Rights Council later this month. It is based on his mission in December to several U.S. states, including rural Alabama, a slum in downtown Los Angeles, California, and the U.S. territory of Puerto Rico. A U.S. official in Geneva, asked for comment, told Reuters: The Trump Administration has made it a priority to provide economic opportunity for all Americans. Citing shameful statistics linked to entrenched racial discrimination, Alston said that African Americans are 2.5 times more likely than whites to live in poverty and their unemployment rate is more than double. Women, Hispanics, immigrants, and indigenous people also suffer high rates. At least 550,000 people are homeless in America, he said. The tax reform will worsen this situation and ensure that the United States remains the most unequal society in the developed world, Alston said. The planned dramatic cuts in welfare will essentially shred crucial dimensions of a safety net that is already full of holes. The tax overhaul, which sailed through the Republican-controlled U.S. Congress in December, permanently cut the top corporate rate to 21 percent from 35 percent. Tax cuts for individuals, however, are temporary and expire after 2025. Trump has said they will lead to more take-home pay for workers and has touted bonuses some workers received from their employers as evidence the law is working. Alston dismissed allegations of widespread fraud in the welfare system and criticized the U.S. criminal justice system. It sets large bail bonds for a defendant seeking to go free pending trial, meaning wealthy suspects can afford bail while the poor remain in custody, often losing their jobs, he said. There is no magic recipe for eliminating extreme poverty and each level of government must make its own good-faith decisions. At the end of the day, however, particularly in a rich country like the United States, the persistence of extreme poverty is a political choice made by those in power, he said. 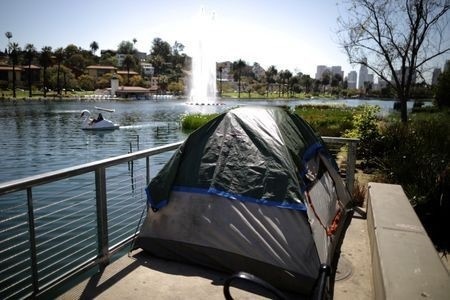 A tent is seen next to Echo Park Lake in Los Angeles CA, 11 April 2018. Source: Lucy Nicholson/Reuters.